A modern and refined medallion style damask, beautifully hand screen printed with metallic ink creating a contrasting shimmer effect. The luxurious velvet base offers the ultimate statement feature with an embossed texture in contrast to the smooth and shiny printed surface. 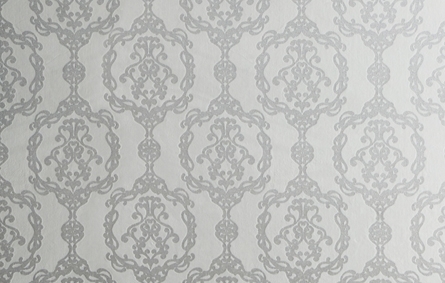 This fabric is available with Swarovski® crystals and can be laminated for textile panelling as shown in image.